The first news of this salami is found in a series of Renaissance sources, kept in the Cremona State Archives. During the age of Lombardic, the production area was recognized in the current territory of the province of Cremona and around the middle of the 1800s included the basin of the Val Padana and the Alpine valleys. The processing of Salame Cremona PGI takes place in the regions of Lombardy, Piedmont, Veneto and Emilia Romagna. The production of Salame Cremona PGI has the following steps: selection of different cuts of meat; grinding, salting and supplement of the typical aromas (salt, spices, peppercorns and crushed garlic and spread in the mixture); paste; packing and tying; drying and maturing. At the end of maturing, the weight must never be less than 500g, while the maturation process cannot be less than 5 weeks. Maturing is carried out in rooms with temperatures between 11 °C and 16 °C. The production Regulation says that the diameter of salami can be from a minimum of 65mm to over 100mm. Furthermore the meat and fat part in Salame Cremona PGI must be homogeneous. Salame Cremona PGI has a cylindrical shape, sometimes irregular. It has a compact but soft consistency; the color is an intense red, the aroma quite spicy; the taste is strong but not sour. Very tasty with sour fruit like kiwi, but also with melon and figs. Every year the “Festa del Salame” takes place in Cremona. 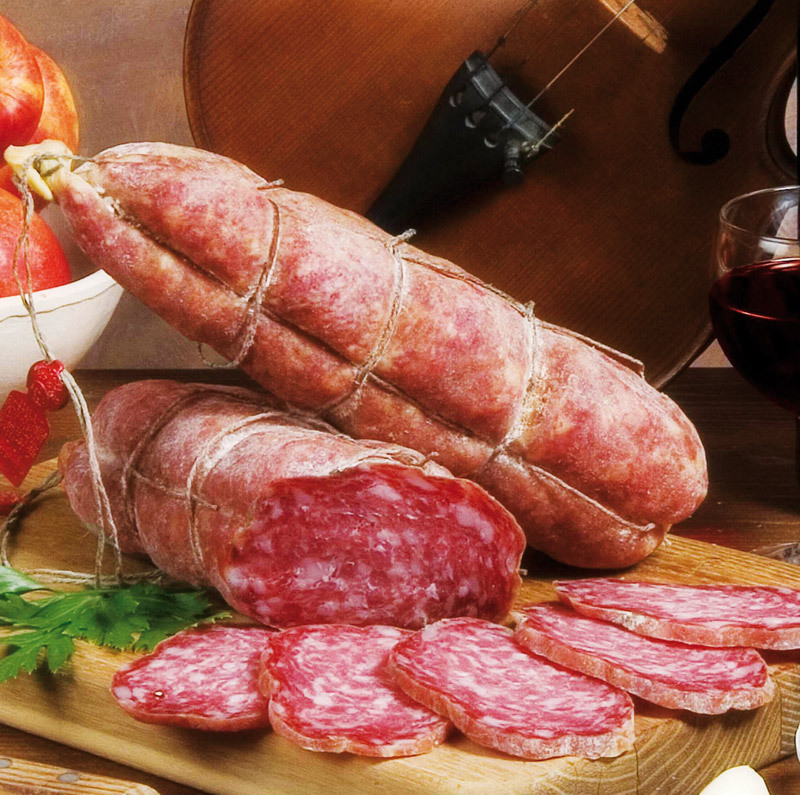 For the occasion, there are tastings of bread and salami, concerts, shows and photographic exhibitions, in honor of Salame Cremona PGI. The characteristics of Salame Cremona PGI comes from the land that borders the Po, in which there are salami that has a slow maturation in a humid climate. Protected Geographical Indication (PGI) recognized under Reg.ne EU Reg.to CE n. 1362 of 23.11.2007 GUCE L. 305 of 23.11.2007.